Infamy, of course. So said Franklin Delano Roosevelt to a joint session of Congress the next day, asking for a declaration of war that was promptly granted by the Senate 82-0 and by the House 388 to 1 (the lone “nay” came from Jeanette Rankin, a woman with the courage of her absurd pacifist convictions – see my Rebel Media piece from April 2). The next day Germany and Italy declared war on the United States, neatly solving FDR’s problem of concentrating on the greater menace of Nazi Germany despite greater popular anger at Japan. 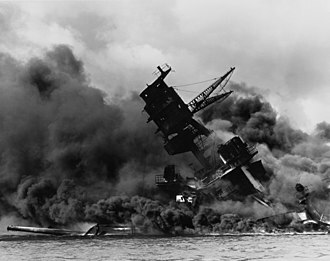 I do not know if Pearl Harbor still lives in infamy. In the United States in significant measure it does. But forever is a long time, and things keep happening, and most young people doubtless remember what happened on 9/11 more clearly than 7/12. But both were sneak attacks by merciless foes who totally misunderstood the nature of their adversary. One senior Japanese figure who had spent time in the United States, Admiral Isoroku Yamamoto, who planned the attack, knew it was a terrible mistake. “I fear we have only awakened a sleeping giant and filled him with a terrible resolve.” And so it proved. Remember: Japan spent a decade plotting to pounce on the United States, defeat it and so demoralize it that it quit. The United States turned around and, despite losing much of its Pacific fleet at Pearl, delivered a devastating blow to Japan at Midway just seven months later with an outnumbered and outgunned task force, turning the tide of the war in the Pacific forever. Likewise, it was not three months from the fall of the World Trade Centre towers to the fall of the Taliban in supposedly impenetrable Afghanistan. It is true that the United States found “rebuilding” Afghanistan harder practically and conceptually than ousting the odious regime that sheltered Osama bin Laden. (Well, one of them, anyway.) But still, there seem to be two pretty clear lessons here. First, our enemies hate us, spend years plotting against us, and will sneak up on us and try to do us in if given half a chance. Second, whoever attacks the Anglosphere should dig themselves a nice comfy grave first. The second is some comfort given how reliably we seem to overlook the first. Perhaps Dec. 7 is a good day to remember both.